Editor’s note: NerdWallet’s Step by Step series gives small-business owners a behind-the-scenes look at the loan application processes for various online lenders. We show you what to expect as you submit your application. If you’re looking for inexpensive financing for your small business, SmartBiz is one of your best options when it comes to online small-business loans. 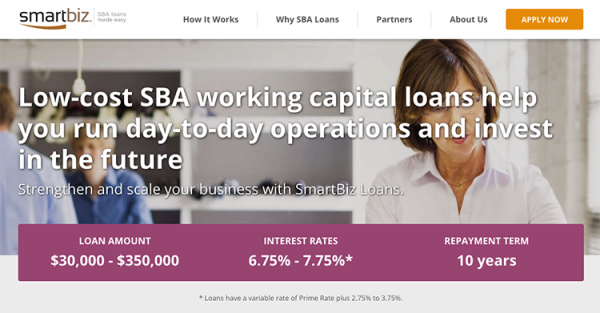 SmartBiz provides SBA loans faster than traditional banks via its online lending platform and offers the lowest rates among online alternative lenders. But there’s a catch: To be approved, your personal and business finances must be in solid shape, and you could find the application process time-consuming and exasperating. In fact, among online small-business lenders, SmartBiz is known for requiring the most documents due to the Small Business Administration’s strict requirements. “Documents and more documents and more documents” is how Henry Feintuch describes it. But was the effort worth it? The New York entrepreneur, pictured above left, says he’s happy with his loan. Follow along below as we use his experience to examine the SmartBiz loan application process. For more details, read our SmartBiz review. Time to complete: If you can submit all required documents immediately, you can be approved and funded in seven days. But expect the process to take several weeks to a few months depending on how many documents are required and how quickly you submit them. Deed(s), title policy(ies) or lease agreement(s) for all real estate owned or used by the business. A lease agreement would include a subordination release from your landlord. Additional documents may be requested, depending on your business and personal situation. Nerd note: You’d find a longer list of required documents on the SBA site. The good news is SmartBiz does not require some of the documents, such as resumes, business projections or a loan application history. Let’s start with an overview of the SmartBiz loan. SmartBiz processes loans guaranteed by the U.S. Small Business Administration. Better known as SBA loans, this type of financing has traditionally been offered by banks, where the approval process is known to take months. Rejected applications are common, usually because borrowers fail to meet stringent requirements imposed by the SBA and participating banks. Feintuch, president of Feintuch Communications, a six-person public relations firm, said he considered getting an SBA loan through his business bank twice. Both times, he withdrew after the bank indicated he probably wouldn’t be approved due to the economy, limited experience or insufficient capital and collateral. “Traditional bank lending was not happening,” he said. So he began exploring online small-business lending. That led him to SmartBiz. The online lender works with partner banks in processing SBA loans and uses a platform to speed up and streamline the SBA process. Nerd note: Why would Feintuch’s SBA loan application be rejected by one bank but approved by another? Because “each bank takes the same SBA eligibility requirements and layers their own credit and underwriting on top of those,” SmartBiz Chief Marketing Officer Judy Balint tells NerdWallet. The interest rate range for SmartBiz loans is set at 7.25% to 8.25%. That’s based on the current SBA loan rate: prime rate (4.5%) plus a markup rate (2.75% to 3.75%), known as the spread. The interest rate differs from the APR, which is the true cost of a loan, taking fees and other costs into account. SmartBiz takes a 4% cut from the approved loan to cover “referral and packaging fees” and passes on bank closing costs. There is also an SBA guarantee fee of 2.25% for loans above $151,000. SmartBiz explains this on its “Apply Now” page. With fees, SmartBiz’s APR is 8.53% to 9.83%, which is one of the lowest among online small-business lenders. 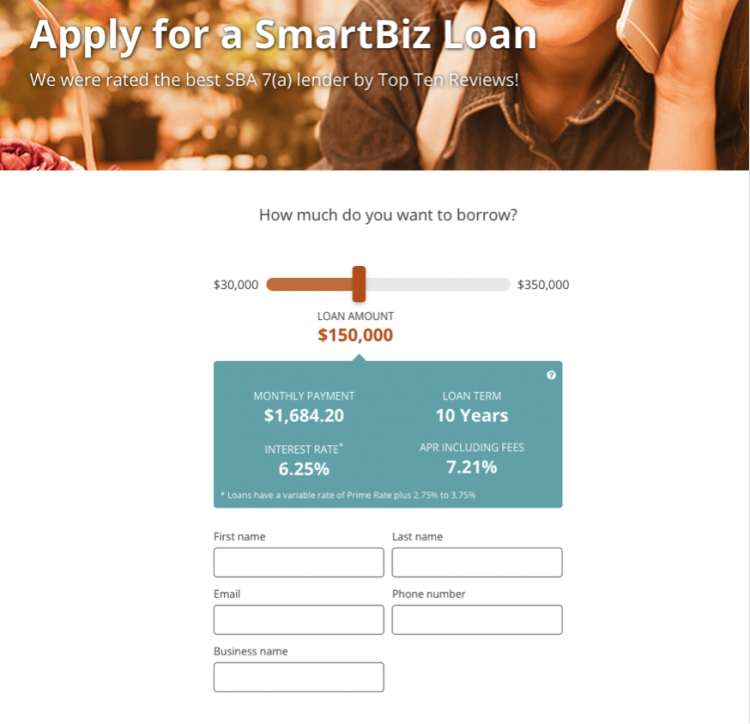 Clicking on the “Apply Now” button at the bottom of the homepage takes you to a SmartBiz tool for exploring different loan scenarios, including monthly payments, interest rates and APR. You begin your application by filling out the form on the page. 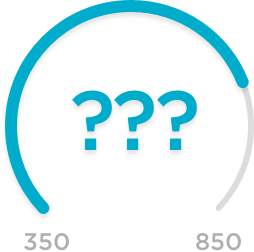 No minimum credit score, but the average FICO score among borrowers is 705. At least two years in business, though the average is 10 years. No minimum revenue requirement, but most borrowers report $50,000 to $5 million. Average is $1 million. NAICS code (this refers to the North American Industry Classification System used to classify businesses for collecting, analyzing and publishing statistical data on the U.S. economy; go to the SBA site to find yours). Your citizenship (you have to be a U.S. citizen or legal permanent resident). Government-issued photo ID number (U.S. passport, permanent resident card, driver’s license, U.S. military ID; you just need to provide a number at this stage, though you’ll have to send photocopies later). For Feintuch, pre-qualification was a breeze. On Day 3, Feintuch’s relationship manager was back in touch by email to tell him that his loan applications was “in the final stage of underwriting.” With the notice was a request for 15 documents. Nerd note: Feintuch enjoyed a key advantage. He had people to help him with the paperwork, including an accountant and an attorney. So keep in mind that it may take you more time to fulfill the requirements if you’re on your own, have limited staff or don’t have your business and personal files in order. Feintuch spent Day 4 sending more of the documents. On Day 5, Feintuch said he sent the document related to his lease extension. Other requests followed: SmartBiz asked permission to contact his business insurance company to verify and get more information on Feintuch’s account. The lender also wanted Feintuch’s landlord to subordinate the lien on his office assets to SmartBiz and its partner bank. This is a standard practice when getting a major loan (i.e., a business loan or mortgage), in which another party, such as a landlord, agrees that another party, such as a bank, would be paid first in the event of the borrower’s bankruptcy. At the end of Day 5, Feintuch received a notice that surprised him: SmartBiz didn’t just approve his loan, the lender was also offering a larger amount. Instead of $50,000, Feintuch could borrow up to $150,000. SmartBiz made the offer even as it stressed the importance of its lease subordination request. Day 8 brought an additional request. SmartBiz noted, from his tax returns, that Feintuch owed the IRS money. The entrepreneur was in the process of paying that debt. SmartBiz wanted documentation of his payments and the payment agreement with the IRS. Feintuch sent documentation of his IRS payments on Day 10. On Day 12, Feintuch found out his loan had been approved. He received two emails that day, one from SmartBiz and another from Celtic Bank, one of SmartBiz’s three bank partners, which was funding the loan. On Day 13, Feintuch got his loan. An email from Celtic Bank informed him the funds had been wired to his bank account. SmartBiz’s fees and other costs, representing 4% of the loan, had already been deducted from the total amount. Feintuch began with a monthly payment of around $1,111. He has 10 years to pay it all back. NerdWallet has created a comparison tool of the best small-business loans to meet your needs and goals. We gauged lender trustworthiness and user experience, among other factors, and arranged lenders by categories that include your revenue and how long you’ve been in business.